Molly Maid partners with Fishman Public Relations to share and celebrate the stories of our customers, our franchise owners, our leaders and our brand. Molly Maid has been recognized in the press as the expert source for residential cleaning trends and tips and as an impressive franchise opportunity. We are also very proud of the accomplishments of the Ms. Molly Foundation - a foundation developed specifically to support victims of domestic violence. Take a look at our recent secured placements, and find out more about Molly Maid. For media inquiries, please contact Leah Cotton at Fishman Public Relations at (847) 945-1300. Image courtesy of Dennis Skley on Flickr. Molly Maid Franchisee Christina Clark went from cleaning homes to owning two Florida territories. Take a look at these tips for organizing and decluttering your home..
How often do you wash your sheets? Did you know most experts recommend washing your sheets at east once every two weeks? Calling all cat lovers, this ones for you. Learn about how to get the cat smell out of your home. Read this article to learn about some of the best cleaning tips. Do you know what makes a "deep clean" deep? Take a look at this article to find out! Just when you think you have your entire house cleaned...think again! Check out these commonly missed areas of the home. Stop losing clothes to your washer and dryer. Take a look at how to avoid some common laundry mishaps. Fall is around the corner! Here are 50 ways you can be healthier this season. From leaving knobs grubby to cooking on the wrong setting, avoid making these oven mistakes in your kitchen. Take a look at these summer cleaning tips. The best part is you probably already have these cleaning items laying around your home. Check out these top cleaning tips for your bathroom. Take a look at these expert tips on how to tackle pet messes in a safe and smart way! Before you pick up that sponge, take a look at these mistakes to avoid while cleaning your kitchen. It's time for Spring Cleaning! Take a look at these unusual cleaning hacks for your home!. Take a look at these "best cleaning hacks" from Hispanic cleaning experts. Spring is here! Check out these 5 cleaning hacks from the pro's! Check out these 7 cleaning tips to keep the flu from spreading in your home. Take a look at this holiday cleaning countdown to learn how to break up cleaning chores to make the holidays a little less stressful. Smudged eyeliner stains got you down? Don't worry! We have tips on how to easily remove eyeliner stains from clothing, upholstery, and carpet. Check them out! Learn how growing up in a military household prepared Meg Roberts to be the president of the nation's leading residential cleaning company. Did you know that dusting with microfiber cloths helps trap the dust and dirt around your home rather than pushing the dust around? 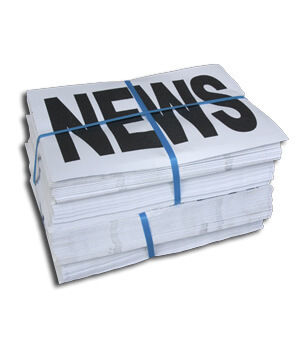 Check out the news article to learn additional simple secrets to a dust-free house. Here are some tips on what you should know and ask before hiring a cleaning service. Check out these 6 things professional house cleaners wish you knew, before hiring them. Learn about the important business and leadership lessons Molly Maid President, Meg Roberts learned from growing up in a military family. Take a look at these tips on how often you should clean your iron - and the right way to do it. Say goodbye to those brown stains left behind on your clothes! Take a look at some cleaning tips and rules you no longer have to follow, and alternatives you can try instead. Ever wonder what is the best way to clean your toaster? Check out these toaster cleaning tips from Realtor.com. Make sure to try the wax paper technique, provided by Molly Maid. Have you ever wondered how to remove a butter stain? Take a look at these butter stain removal tips from Molly Maid and The Kitchn. Take a look at this article for a variety of cleaning tips and best practices for dusting, scrubbing, mopping and vacuuming from multiple cleaning experts, including Molly Maid. Do you ever have less than an hour to get your home cleaned? Take a look at these speed cleaning tips. Who doesn't want more time? Take a look at these time-saving tips from Molly Maid. It's time for spring cleaning! Get the help you need with gadgets found in this article. .
Spring is around the corner! Make sure these 11 spots aren’t missed during spring cleaning! A long-time Molly Maid team member helped save her customer's baby's life. WDIV TV attended a surprise team meeting when Molly Maid President Meg Roberts presented the ladies with rewards for their heroism. Love your pet but tired of the clean up? Take a look at this article for the ultimate pet cleaning supplies checklist and some tidying tips from Molly Maid President, Meg Roberts. Do you hate doing chores? Then take a look at this list of companies that will help with your home chores. From doing dishes to walking your dog, and even using an app that actually gets your kids to join in on the fun. Molly Maid is looking to develop the Lubbock, Texas market by the end of this year. Need your home cleaned in a hurry? Take a look at these speed-cleaning tips to get your home sparkling clean. DIY cleaning products are on the rise! Take a look at this article and review some of the precautionary measures you should take before you consider making your own products. Take a look at this article written by Molly Maid President Meg Roberts, and learn how businesses can use technology to stay relevant and still deliver a personalized service. Check out this interview between Meg Roberts, President of Molly Maid and Patrick Chism from ZING! By Quicken Loans to learn tips on how to keep your home clean. Take a look at these tips for properly and safely storing your cleaning products. Check out these 12 simple tips which can help you avoid contacting the flu and other illnesses this winter. Molly Maid President Meg Roberts, discusses bathtub cleaning tips with houzz. Take a look at these 4 Secrets to a Shiny-Clean Bathtub. Meg Roberts, President of Molly Maid shares cleaning tips on areas in the kitchen that require immediate attention. Meg Roberts, President of Molly Maid shares cleaning tips with Angie's List on how to clean your home when you're expecting company. Molly Maid shares some tips with Family Circle magazine on how to stay healthy during cold and flu season while working and caring for your children. Meg Roberts, President of Molly Maid helps today.com readers get ready for the holidays with the five-day cleaning countdown. Molly Maid shares some microwave cleaning tips with houzz. Molly Maid was contacted by Real Simple magazine to help a reader clean a black ring from a glass stovetop. Molly Maid offered Today.com readers several tips to clean your home after a family member is sick with the cold or flu. Delta Sky Magazine recently interviewed Molly Maid President Meg Roberts to find out more about the lifestyle franchise opportunities with the 31-year-old brand affords. Biz Opportunities interviewed Katrina Keith, owner of Molly Maid of DFW Metro Northwest received the 2014 Franchisee of the Year Award. The Dwyer Group acquires Service Brands International, adding Molly Maid®, Mr. Handyman® and ProTect Painters® to the portfolio. Molly Maid Partners with Grand Traverse Pie Company to Offer a Chance to Win a House Cleaning & Chocolate Stout Pie. 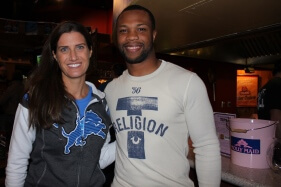 Detroit Lions Safety Glover Quin joined Molly Maid and the Ms. Molly Foundation at a fund-raising event on Tuesday, Nov. 4. His work to raise awareness and funds for victims of domestic violence earned him this prestigious recognition. Household items can help speed up house cleaning and also help you save money on cleaning products! Fox 16 News in Little Rock, Arkansas featured Molly Maid's professional house cleaning tips in this segment. Molly Maid of Central Anne Arundel County owner Donna Reilly shares tips to making cleaning more fun with the goal of getting your kids involved! You may be surprised to learn some shortcuts that can cut your spring cleaning chore! Cut the effort with Michael-Silva Nash's tips for spring cleaning and save money while you're at it. Molly Maid of Greater Little Rock Executive Vice President Michael Silva-Nash appeared on KATV 12 to share Molly Maid's pre- and post-holiday cleaning tips. Remove lipstick stains from wine glasses and many other unique cleaning tips are shared from Molly Maid's housecleaning experts. Molly Maid of Greater Little Rock Executive Vice President Michael Silva-Nash appeared on WTHV-TV 11 to share holiday cleaning tips families can quickly complete! He also shared the Ms. Molly Making Life Bearable program, which helps children staying in domestic violence shelters enjoy something of their own. Molly Maid of Greater Little Rock's Michael Silva-Nash shared tips on KARK TV to help make mornings easier as kids and parents prepare for back to school season. Molly Maid of Baltimore Inner Harbor & White Marsh owner Dianne McRae shared tips to keep bugs out of the house this summer on WBAL-TV. Check out ideas to get rid of flies, ants, fruit flies and roaches! Back to school season is chaotic! Molly Maid of Greater Little Rock's Michael Silva-Nash shares ideas for families to get organized and make the first day of school a success. Christine Clark, owner of Molly Maid of NW Florida appeared on WALA-TV-Pensacola to share the tips you need to win back your kitchen and get rid of fruit flies.